Greetings, non-citizens and/or future voters! As you may recall, I recently explained to (at, whatever) foreigners and children how the United States’ political parties work. Since that was a rousing success – mostly because neither of you have command of my language to voice your objections – I’ve been tapped to now explain the three branches of our government. The three branches are the executive, legislative and judicial branches. These were delineated all the way back in 1789, when a group of self-selected landowners (mostly lawyers) met to secretly and kind of/sort of illegally overhaul our existing government as outlined in the Articles of Confederation. This was the now legal framing of our famed Constitution. Maybe you’ve seen it in your tour through Ron Paul’s breast pocket? To reflect this spirit of open contempt towards our law of the land, they intentionally set up a lawyer-driven three-way deathmatch between three equal branches. This cage fight is called “checks and balances,” which was based on the use of elbows and fleet footwork in Senate-floor cane brawls. Because of the amount of information involved, and because every element of our government is ripe for jokes, I’ve divided this into a three part series. Last week, I explained the executive branch. This week, it’s the legislative branch. The U.S. legislative branch, or Congress, is a bicameral body consisting of the Senate and the House of Representatives. It was established as bicameral in our Constitution because the framers read a lot of Shakespeare and knew it would be funny to shout, “A plague on both your houses!” whenever Congress fails to get anything done. The composition of the Senate and the House are based on a compromise over whether every state should have equal representation or representation that is based on each state’s population. Each state sends a representative number to the House (which meant that, in the early days, Rhode Island was represented by half of an oyster-shucker, a punishment for refusing to send delegates to the Constitutional Convention) and two senators to the Senate. Senators always travel in pairs so that they can pose as married couples when traveling abroad. And he's still misting up a little. The House is the lower of the two congressional houses. It consists of directly elected representatives from their state and is based, as stated above, on their state’s population. After a mix-up in the early days of the postal service when two shucker halves arrived in the mail, the two were sewn together and it was agreed that every state would have at least one whole representative. House members serve two-year terms, which means they have one month to buff up in the Capitol’s gym before they have to begin campaigning again. 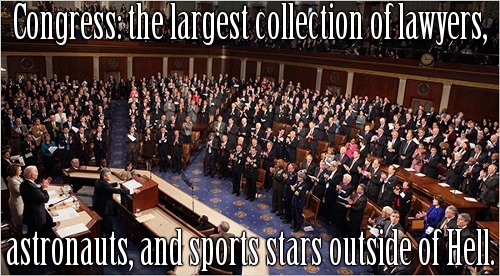 At this time, there are 423 representatives in the House, 53 of which are from the most populated state, California. There are also 6 non-voting positions, whom represent the District of Columbia and the territories of American Samoa, Guam, the Northern Mariana Islands, and the U.S. Virgin Islands. They are permitted to debate issues on the floor and keep the C-SPAN cameras in focus. Puerto Rico gets an especial non-voting member called the Resident Commissioner, who serves for four years reminding everyone that their flag is the only non-rectangular flag in the U.S. The House is lead by the Speaker, who is elected by the members of the House. Although the Constitution does not state they have to be a member of the House, this is typically the Majority Leader, which is the party with the most members of the House. The Speaker recognizes who is allowed to speak and selects the committees that will hold meetings about major league baseball and who is un-American today. There is also a Minority Leader, who only gets to decide in which order the minority party House members line up in the cafeteria. Each party also has a designated whip, who uses all means necessary to ensure their party members vote a certain way. Moderates, who have a low tolerance for torture, have been resigning en masse in this current political climate. Those bills must also pass in the Senate and either be signed into law by the President or approved by a two-thirds vote in both the House and the Senate. Also, their laws can be ruled unconstitutional by the U.S. Supreme Court. But, their biggest weakness by far is the Internet, where every photo and tweet exists forever. The Senate is a lot like the House, only Senators serve six year terms and rub all their real power in the faces of House members during cocktail parties. The President of the Senate is the Vice President of the United States, but he usually doesn’t attend unless he gets to actually vote, which is only in a tie, but still more than Puerto Rico, which doesn’t even have a dog in this fight. 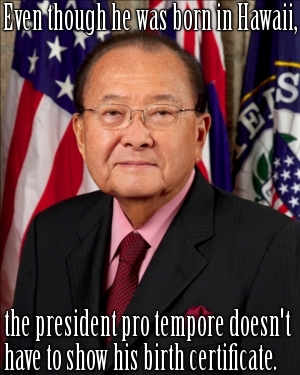 Instead, most Senate sessions are run by the president pro tempore that the other members elect. Like the House, there are also majority and minority leaders and their whips. However, the president pro tempore is not usually the either of the party leaders because the Senate has so much more to do. The Senate votes on all the same kinds of bills that the House does, but it also consents to treaties so that both houses may vote on their ratification, confirms appointment positions like judges and military officers and tries federal officials that have been impeached by the House. There really aren’t any. These guys are like cockroaches. Once they’re in, the only way to get rid of them (even in the House) is with a two-thirds vote of the members, retirement or death. The only ways to lure them away are with lucrative promotions, high-paying lobbyist or think tank positions or personal scandals. And that’s just the legislative branch. Tune in next week for the judicial branch. Rick Snee writes daily for SeriouslyGuys.com, podcasts with the Blast Shields Down Film Review Society, and makes up for his lack of punctuality with a willingness to go ATM. I wish our elementary school civics classes had been this informative and entertaining at the same time. Oh wait … I went to Catholic school. Forget it. We had to salute the flag AND the cross every morning. Laughing at the government in school would have been something akin to treason. That doesn’t mean I can’t laugh now, though, does it. So educational. 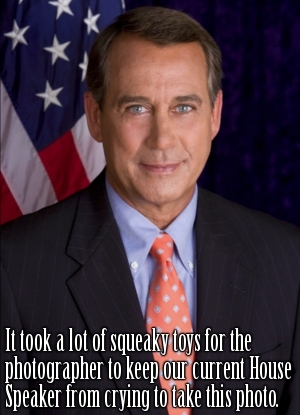 I always wondered what the House Minority Leader did. The cafeteria line–now, that makes sense! Another fun post, Rick! !